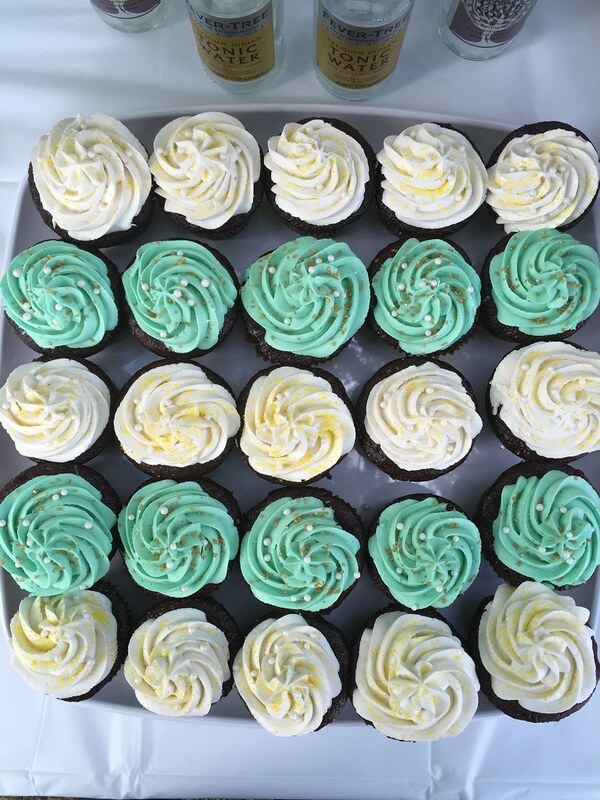 Last week, I made a big batch of chocolate baby shower cupcakes (see below) with fluffy vanilla buttercream frosting. This week, ant-pocalypse descended upon my kitchen. What does that have to do with quick veggie curry? Pretty much nothing, except that the onslaught of insects forced me to cook said curry in the small non-infested corner of my kitchen. The entire contents of my countertop are chilling on the kitchen table, the dish drying rack is on the counter space I would normally use to cook, and we are using the couch as our dinner table. But I’m making it work. Kind of like life right now, which is so busy that neither Steve nor I have found the time to run down the street and buy some ant traps. I just gave the counter a good vinegar wipedown, discovering all the sugar and turquoise food coloring I missed four days ago (oopsies), Steve applied some caulk at the suspected openings, and we’re hoping the few remaining critters will die off without any food or an escape route. I decided that today calls for a couple life updates, but if you are, um, ant-sy, to get to the curry recipe, just click here. 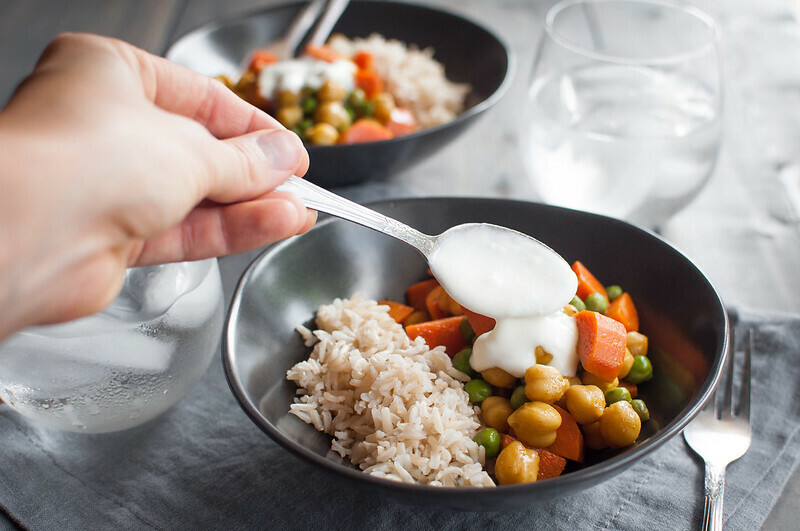 Summary: it’s fast, a great use for the homemade coconut milk we made on Tuesday, and, possibly, with its familiar peas and carrots combo, a kid-friendly introduction to Indian curry. As some of you are heading back to school, I’m packing up my photography gear, computer, plenty of snacks, and, oh yeah, some clothes, and heading to Minnesota for two weeks! I hate mentioning the countdown, but I get married in under three months, and it’s time to get my feet on the ground for a busy couple weeks of planning our “destination” wedding. I really just want it to be here and the planning to be done, but I’m trying to enjoy the details when I think of it. We fly into MSP on Thursday and hit the ground running, starting with dinner at Spoon and Stable to work through tons of food and wine. I mean the details of our rehearsal dinner. One or the other. Definitely not mad about that activity. I won’t bore you with the rest of the wedding details, except the fact that I plan on serving (and eating) enchiladas at my reception, and I don’t care that the catering director thinks I’m crazy. If you haven’t yet, follow me on the ‘gram for updates, mostly of what I’m eating and drinking. Before I pack it up, let’s talk a bit about this curry. Last week I hosted some girl friends for our last cooking dinner party of the summer. I demonstrated how easy it is to make homemade coconut milk while you get some rice going and gather a few simple curry ingredients. It’s most accurate to say this is an Indian-inspired dish, because it’s not purist authentic Indian curry. The truth is, you don’t need to shop for and hand grind 8 crazy spices or spend 32 minutes chopping onions, garlic, ginger, and vegetables. 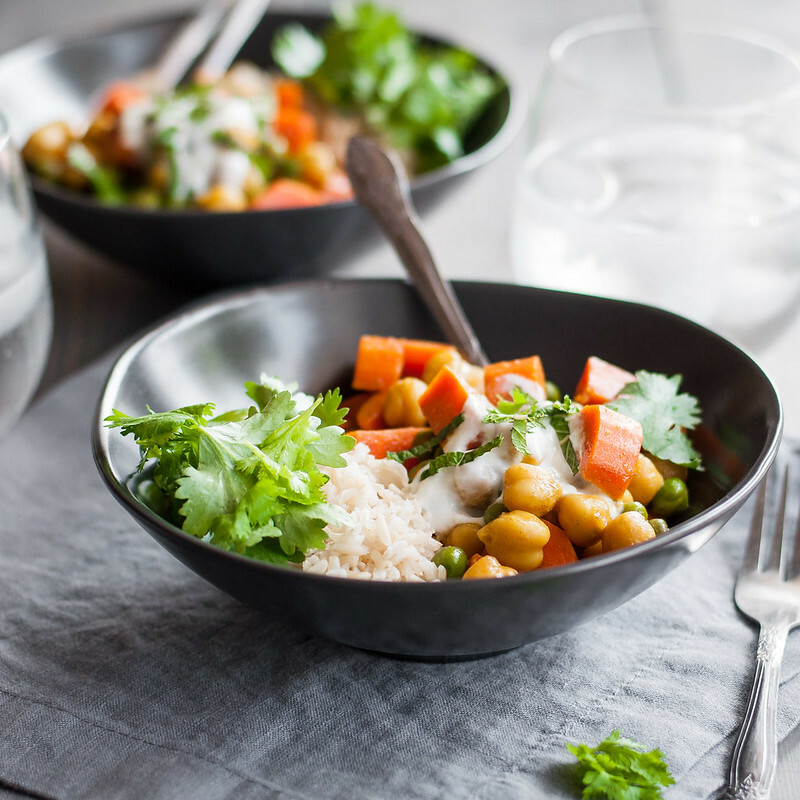 Save that for a weekend project, and get ready to be amazed by how few ingredients you need for a weeknight taste of curry. 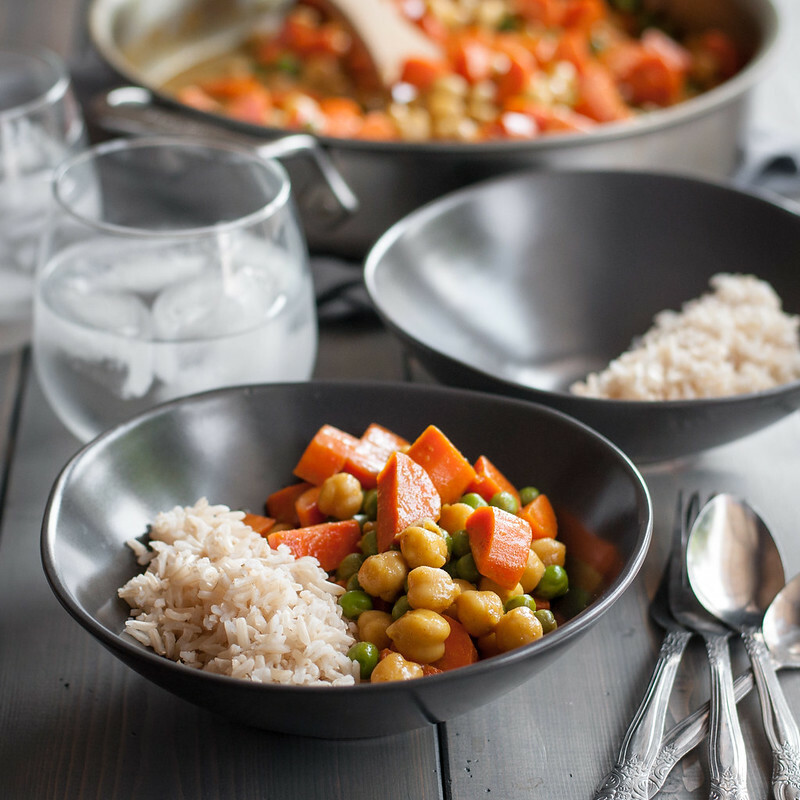 Unlike its Indian restaurant counterparts, this homemade veggie version is truly healthy, without sugar or beads of oil floating on the surface. At the same time, it’s the ultimate comfort food, just like cheesy corn pie, only this time it’s vegan. 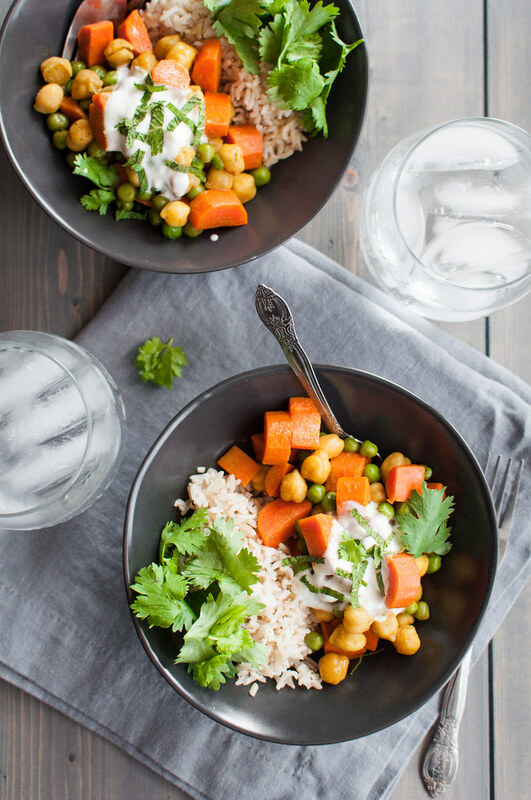 To save even more time, use frozen carrots or veggies and canned coconut milk. This is a rare case I’d recommend light coconut milk. Many “quick” curry recipes call for broth and coconut milk, but by using a slightly thinner coconut milk, we save an entire ingredient. If you have time to spare, onion, garlic, and ginger, sautéed in the hot oil before adding the curry powder, will definitely add flair (oh hey, that rhymes). You can also mix in some extra spices of your choice without much added effort. 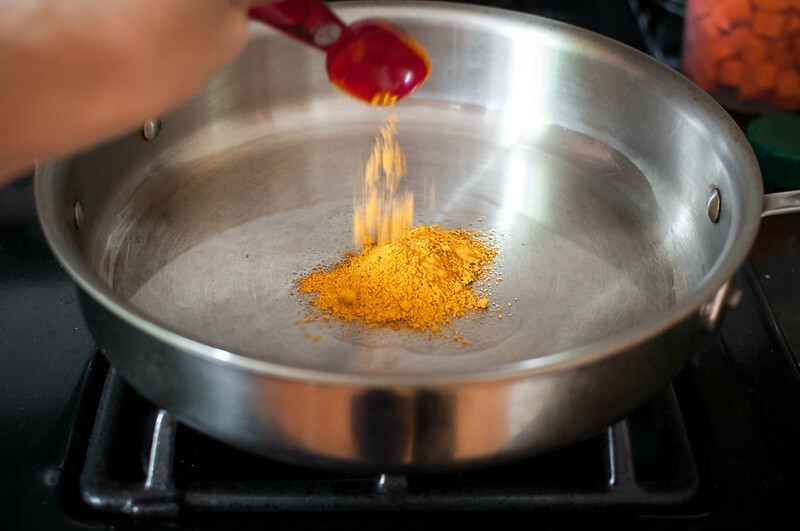 To spice up your curry and temporarily stink up your kitchen, I like cumin, coriander, chili powder, and turmeric. As with most Indian food, get liberal with the spices. 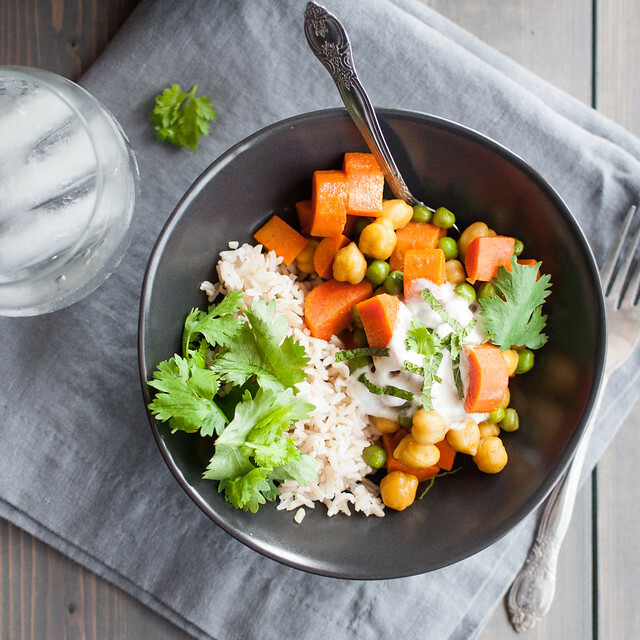 Cauliflower rice is a lighter substitute for brown rice or quinoa, but it won’t absorb all that delicious curry flavor from the sauce quite like cooked grains or seeds–consider yourself warned. That said, when the girls and I prepared our curry with cauliflower rice, it was greeted with exclamations of its life-changing properties. Or maybe that was waist-saving. Let me see all your curry variations on social media! Whatever your lighting situation or cooking skill level, I always love to see your NCK-inspired creations, tagged, of course, with #NCKhomemade! 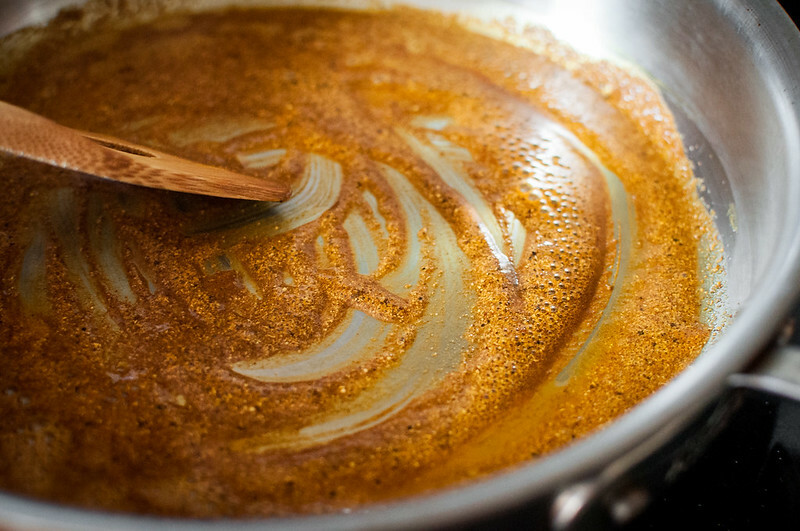 The secret to this super fast, mild curry is taking a couple minutes to sauté the spices in melted coconut oil. It deepens their flavors, eliminating the need for lots of aromatics that take up time to chop and cook. If you haven't made the rice yet, get it started (cook per package instructions) and make the curry while it cooks. If the peas are frozen, take them out so they begin to thaw. Heat oil over medium in a Dutch oven or 3 qt. deep skillet. When melted and hot, add curry powder or spices. Stir constantly about 2 minutes, until mixture is a smooth, fluid sauce and the spices are very fragrant. If they stick to the pan or smoke, reduce heat slightly. Carefully add coconut milk--it will sizzle and steam! Stir to incorporate spices. 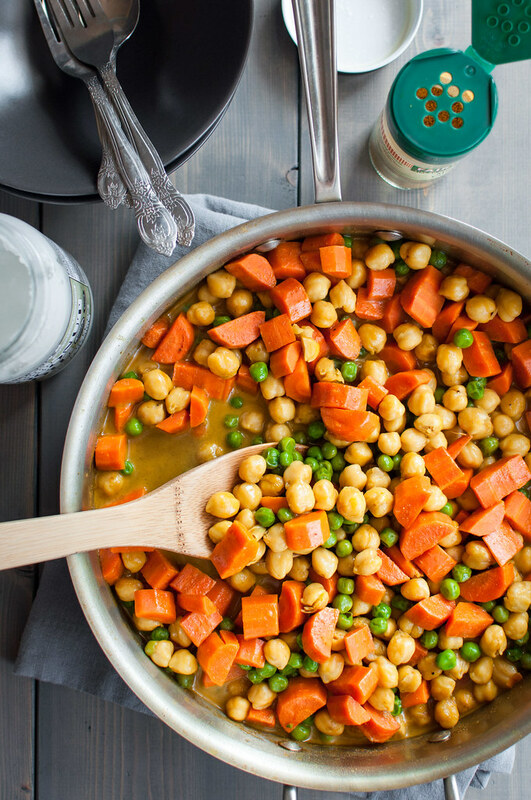 Add carrots and chickpeas, increase heat, and bring to a boil. Reduce heat and simmer, stirring occasionally, until carrots are tender and liquid is reduced, about 7 minutes. Add peas and simmer until warmed through, about 3 minutes if they're not fully thawed. Turn off heat and season to taste. Serve over rice or grain of choice with your favorite condiments. 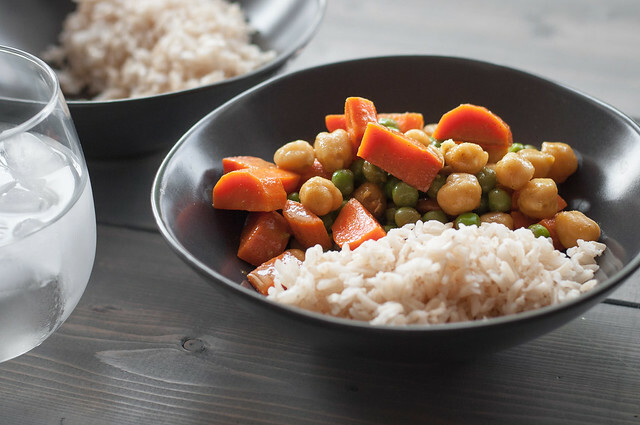 You can also serve the curry as more of a soup, without rice, if you're watching your grains intake. Substitute any vegetables you like. I chose carrots and peas because they're always easy to find, are relatively kid-friendly, and their quality isn't hugely affected by seasonality. 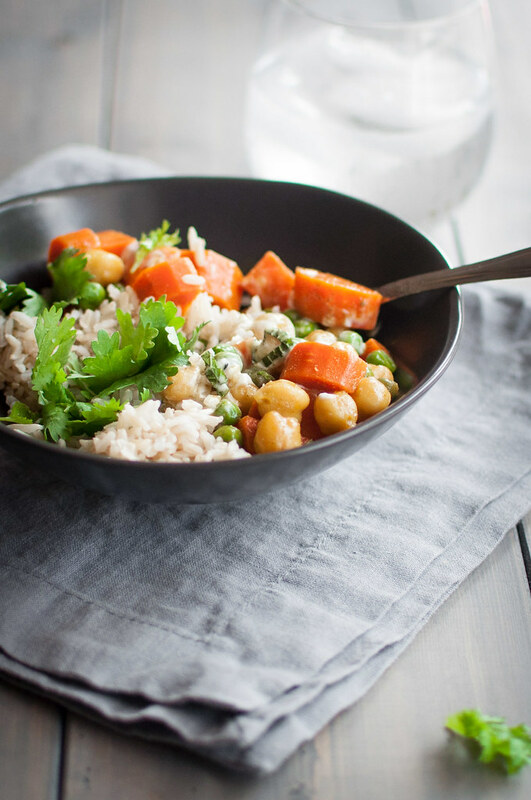 Add firm, slow cooking vegetables (cauliflower, broccoli, potatoes) with the coconut milk, so they have time to soften. Small, quick-cooking vegetables (onions, bell peppers, squash, leafy greens) can be added and sautéed with the spices, or added later, when you anticipate about 5 more minutes of simmering. As written, recipe is vegan and gluten free (before condiments). Note: This page contains affiliate links. It does NOT contain sponsored content. Affiliate links (to products I recommend, on Amazon) offset my ingredient and website maintenance costs, so I can keep bringing you vegan recipes like this one. Thanks!